Growing Cabernet Franc is a promising prospect for Hudson Valley growers and winemakers, especially if you understand the conditions under which it grows best. So, who better to help us understand the feasibility of Cab Franc than Peter Jentsch, Research Entomologist and Superintendent at the Hudson Valley Research Lab (HVRL) in Highland, NY. 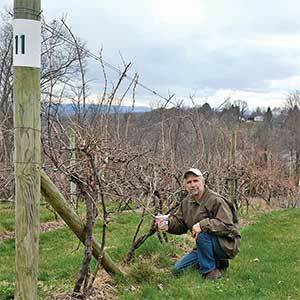 He’s one of four Cornell Cooperative Extension educators who work at the Highland facility, which includes a 20-acre research orchard and vineyard. The HVRL—a non-profit farmer-owned corporation established in 1963—is dedicated to supporting research in the fruit and vegetable industries. While Peter’s staff has been growing grapes for eight years, they plan to focus in more closely on Cab Franc. Ultimately their research will enable all growers to achieve greater success. In this issue, Talking Terroir gets a bit more technical, as Peter explains growing Cab Franc, and its promising potential as the signature grape of the Hudson Valley. Q: Peter, how is the Hudson Valley Research Lab involved in the Cab Franc grape’s future in the Hudson Valley? A: In 2008, Senator Larkin provided us resources to develop the grape industry. We planted a one-acre vineyard with 27 varieties of grapes to get growers aware of what really grows best and makes the best wine in the Hudson Valley. We also set out temperature probes throughout the region to determine the best sites for different varieties. Now we’re putting together a proposal for the Signature Grape Project, so we can work with all the Cab Franc growers over the next three years to discern what goes into making the best wines at each particular site. We’ll be assessing soils, as well as the canopy, nutrients, management programs, the grapes at harvest, and various aspects of the juice prior to it going into wine. We’re also going to be looking at different Cab Franc strains, as well as different root stock combinations with those strains. Some root stocks are more precocious and produce more foliage and larger clusters, some do really well in poor soils, some do well in well-drained soils. We’re looking for the ideal combo of root stock strain and Cab Franc strain to let the growers know how well they perform here and throughout the region. Q: Why should Cab Franc grow well here? What aspects of the terroir make the conditions favorable? A: Cab Franc has come up for a lot of different reasons. We can grow it really well here, and we can grow it better than any other part of the state because of the amount of sunlight and growing- degree days (GDD) we have. Cab Franc is well known as the most cold hardy V. vinifera variety. We have a cool wine region, and it’s really suited for that compared to varieties grown in California, Chile, and the Bordeaux region. Heat accumulation during our growing season is close to 3,000 GDD, with a shorter growing season in the upper Hudson Valley (less than 180 days) and a longer season in the lower Hudson Valley (over 220 days). Higher heat accumulation and a longer growing season play important roles in proper fruit ripening, flower bud formation, and adequate cane maturation for good winter hardiness. This variety also grows vigorously regardless of the soil type. All of these factors allow a majority of grape growers with moderate to very good sites to grow this one variety, so you have a continuity across the region for this signature grape. And Cab Franc can produce a really good wine. Q: How do Cab Franc grapes grown here differ from those grown in France’s Loire and Bordeaux regions? A: Bordeaux has a maritime climate with approximately 2,700 GDD. The Loire Valley is a wine region with a continental climate like that of the Hudson Valley; nevertheless, it has only 2,400 GDD. Slightly higher seasonal heat accumulation in the Hudson Valley might affect such factors like the yields and the acidity of the juice. However, this is only speculation. The comprehensive answer to this question could be achieved with Cab Franc clonal and rootstock trials across the Hudson Valley. Q: How do clones affect the Cab Franc grape? Do the conditions exist here to create clonal variations? A: Cab Franc has a significant number of clones. They may differ in maturation periods; yield components, vigor, wine aromas, etc. Generally speaking, choosing a clone with specific characteristics allows growers to finely adjust grape production of a certain variety to their needs. Additionally, more clones in a vineyard will provide a higher complexity to the wine as a final product. Q: If a winemaker is new to growing Cab Franc grapes, what are the most important things they should know before planting their first crop? A: First, this is a very vigorous variety that tends to produce long shoots with many lateral shoots if grown on a deep, rich and wet soil. Right vineyard site selection and a good choice of rootstock will help keep the vine in balance to reach desirable grape characteristics. Cab Franc vines that are out of balance produce fruit with green pepper aromas, which comes from chemical compound called 3-Isobutyl-2-methoxypyrazine (IBMP), present in the berries. Recent research done at Cornell shows that early leaf removal once the berries set, and then 30 and 50 days after, can lead to a reduced IBMP concentration in berries due to better exposure to light. Very early crop thinning can help as well. We advise choosing a site with less fertile and shallow soil. Hudson Valley soils vary greatly, but dominant soil textures are loam and silty loam. Those are well-drained soils that could help keeping excessive vigor in check. Finally, Cab Franc is highly susceptible to diseases, including powdery mildew, and leaf and cane spot. Our annual rainfall of 42 inches provides excellent moisture, but also encourages powdery mildew, so we recommend frequent scouting in the spring for the first symptoms. Q: How does the Research Lab help grape growers and winemakers? A: We make recommendations on vine management by sampling the soil at a grower’s site, as well as the foliage and the grapes. We advise on how to manage diseases and insects. We’ve also been recommending specific site locations, whether they are well-suited for moderate temperature grapes like the vinifera, or much more cold hardy hybrids. Now we’re moving toward site-specific varietal, root stock-specific information that will really enhance the economics of the region as well as each individual vineyard. Q: What type of experts are on your staff? A: The laboratory has three key positions that allow us to support agriculturists. We have expertise in pest (insect) management, plant pathology, and horticulture. The horticulturalist is supported by a grape physiologist, who specializes in the Cab Franc plant structure and what’s required to grow fruit. For more information, visit: www.hudsonvalleyresearchlab.org and Peter’s blog, The Jentsch Lab, at blogs.cornell.edu/Jentsch.